Sister Bernadine Janci, SND, daughter of Margaret and Frank Janci Jr., grew up with her younger sister, Mary Jane, in the Lansingville area of Youngstown. Of Slovak heritage, she attended St. Matthias Grade School and Cardinal Mooney High. After graduating in 1959, Bernadine joined the Sisters of Notre Dame of Cleveland, OH, making Final Vows in August, 1967. Sister celebrated her golden jubilee as an SND in 2012. Sister Bernadine received her Bachelor’s Degree in Education from St. John College, Cleveland and a Master’s Degree in Elementary Administration at John Carroll University. She is also a certified Pastoral Minister. 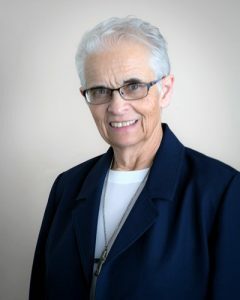 Sister ministered in the Diocese of Youngstown as teacher /elementary school principal for 43 years at Immaculate Heart of Mary School, Austintown; St. James and St. Cyril & Methodius, Warren; St. Aloysius, East Liverpool; St. Peter, Canton; and St. Joseph the Provider School, Campbell. Currently Sister is a Pastoral Minister at St. Joseph the Provider School, Youngstown, and the funeral ministry coordinator at St. Patrick Parish, Hubbard.